In the kaomise production of the piece Junpū Taiheiki in the 11th month of 1736, Ichikawa Ebizō II and Ichikawa Danzō I appeared in the Kawarazaki-za in Edo. In the foreground Ebizō is kneeling as the hero Shinozuka Iga no kami, who was loyal to the emperor, while Danzō plays his opponent, the usurper of the throne Watari Shinzaemon. Both are dressed as courtiers. Similar in style and composition to cat. The two actors appear in a scene from the play Jumpû Taiheiki (“Favourable wind- Taiheiki”), which was performed in the eleventh month of the first Gembun year (1736) at the Kawarazaki-za theatre. Ichikawa, Danjûrô II (1688-1758), who had been using the name Ebizô since 1735- as in our print here- played the positive hero Shinozuka Iga-no-Kami. His courtly robe is decorated with tortoise-shell patterns, ebi (crayfish), and the Ichikawa mon. Kneeling, he appears to be holding his opponent back with outstretched arms. His sword in his raised left hand is embellished with a tsuba bearing the Ichikawa mon. He carries a samurai-eboshi, the headwear of a knight. Ichikawa, Danzô (1684-1740) played Watari, Shinzaemon, who as Daitô (“he who wishes to mount the throne”) wants to be emperor. His courtly dress with peony patterns is complemented by a kammuri headdress, as befits an emperor or an imperial prince. Two marks on his forehead are reminiscent of the fashion of court nobility; the ladies and gentlemen shaved their eyebrows and replaced them with black marks on the forehead. On his breast and sleeves can be seen the crest (mon) appropriate to his role, a circular target (mato). In his right hand he holds a sword with a cockerel’s head, in his left hand raised above his head- a ceremonial rod (shaku). Although identification of the action and the actors seems so easy at first sight, on closer inspection confusion arises. The title of the play, Jumpû Taiheiki, points to a theme from the civil wars of the 14th c. Shinozuka Iga-no-Kami was a vassal of Nitta, Yoshisada (1301-1338), who fought for the cause of the Emperor Go-Daigo (reigned 1319-1338). 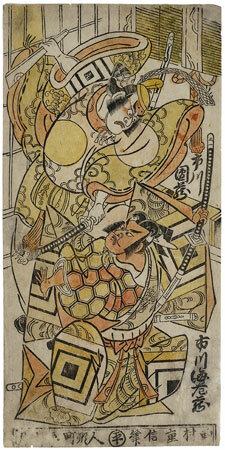 His opponent was Ashikaga, Takauji (1305- 1358). Takauji took Kyôto, dethroned Go-Daigo-tennô, first nominated an imperial prince as Kogon-tennô (reigned 1331-1336) and then nominated another as Kômyô-tennô (reigned 1336-1338). Finally he made himself shôgun. These measures split the empire between northern and southern dynasties. The schism ended only in 1392. It is claimed of Shinozuka Iga-no-Kami that the power of his breath alone was sufficient to blow the enemy far away. Watari Shinzaemon is at first sight impossible to identify. But his identity can be determined by the characteristic costume, his mon and his mask. The theatre play Jumpû Taiheiki was thus a mixture of different “worlds” (kakikae), a well-known Kabuki technique. The real name Heguri of Matori allows an association with the Taiheiki. It is still an open question how far it is admissible to regard Ôtomo, Matori as being identical with Ashikaga, Takauji, who presumed to dethrone the emperor, replaced him at will, and then raised himself to the highest position of government. Shinozuka Iga-no-Kami was in contrast the faithful vassal of the emperor. The play could have been intended as a hidden critique of the political situation. The leaf strongly resembles in style and composition the print discussed on another work The Two Actors Ichikawa, Danzô I and Ôtani, Ryûzaemon, in which Ichikawa, Danzô is also depicted.